Elvis had not only left the building, but he had left the yard, and possibly the whole neighborhood. On one of the hottest days of our Georgia summer. My heart was heavy for the rest of the afternoon and into the evening. Texts to my sister telling her I was thinking about her got no replies. Elvis is no longer a young fellow, and he can’t handle the partying like he used to. I was worried. We all were. He’s been a member of the family for so long I’ve forgotten what he looked like without the white hairs on his muzzle. When the littles and I got in last night, Aub asked if Shaker had called me. I called to get the details. Prayers and wishes had been answered. Elvis was home. Excuse me while I wipe my tears…..from laughing so hard. Bless him. When I finally got to talk to Mess Cat, the story got even better. And I laughed even harder. First of all, my sister, bless her heart, rushed home from work when she got the call, so she could help look for him. So there she was, walking up and down their road, knocking on doors, asking if anyone had seen Elvis. Y’all. I can only imagine the looks on folks’ faces. Too funny. This is the road we grew up on since we were very young, long before they paved it. There are only two neighbors who still live there who have been there for a long time. One of them is Miss Helen. Miss Helen lives next door to Blackberry Flats where we grew up and where Mess Cat and her family, Elvis included, live now. When Mama was in the hospital, Miss Helen, a few years older than Mama, helped us out with things like checking the mail and feeding the cat, Rev. One evening, Mess Cat decided to go back and spend the night at Mama’s. We called to let Miss Helen know that my sister would be at the house, so she wouldn’t be worried when she saw the lights. “That’s all right with me,” Miss Helen replied. That brought us joy, and wondering if something would be all right with Miss Helen was sure to bring a smile during those hard weeks. It still does. So yesterday afternoon as Mess Cat was asking folks if they’d seen Elvis, she was also telling folks she lived next door to Miss Helen. And not many folks looked like they knew who she was talking about. Which means that not many folks are making sure things are all right with Miss Helen. Perish the thought! I cannot imagine. Turns out Elvis had made quite the “Family Circus” trek through and around the neighborhood. Starting with Miss Helen, who said she had seen him earlier. Unfortunately he didn’t check things out with her before heading over to the house next door to her and then the next and then the next. Mess Cat had started knocking on doors of houses where there were other dogs, but in the end, he was found “chilling” on a back deck at a house with cats. Yep. That sounds about right. Elvis has always been a pretty cool cat himself. We are all so happy this little guy is home safe and sound. And look at him bringing all the neighbors together! Folks who might not have met otherwise. He’s quite the social facilitator, bringing strangers together looking for him. Elvis has always been pretty good at that too. Leroy told me he got another call today in response to the sign he had put up. A dear lady said she’d had an Elvis sighting but when she went inside, he left her yard too. That Elvis. Steeped in mystery. Not the first time Elvis has disappeared after being spotted. And today–he was so exhausted. When we went in to see him and give him a welcome home pat on the head today, he was curled up on the couch in his favorite spot–Leroy’s. He was OUT. I mean, I realize he couldn’t hear me call his name, but couldn’t he sense someone was there? I patted his head. No response. I immediately moved my hand to feel if he was breathing. Relief. Not only was he breathing, but he was also SNORING. All that partying yesterday caught up with the old guy. He was worn out. Elvis home today where he belongs. Love this little guy. Tonight I’m thankful for this little dog who came into our life years ago, with the name that never fails to bring us a smile. He is as much a part of our story now as any of us is, I guess. I give thanks for the people who saw him and welcomed him, a stranger, into their lives without questioning it much. There’s a lesson there, I think. I am especially thankful for the ones who called after Leroy put up the sign, and that Elvis is home snoring away tonight. In his own home. Most of all, I’m thankful for a happy ending. I expect Miss Helen’s all right with that. I know I am. 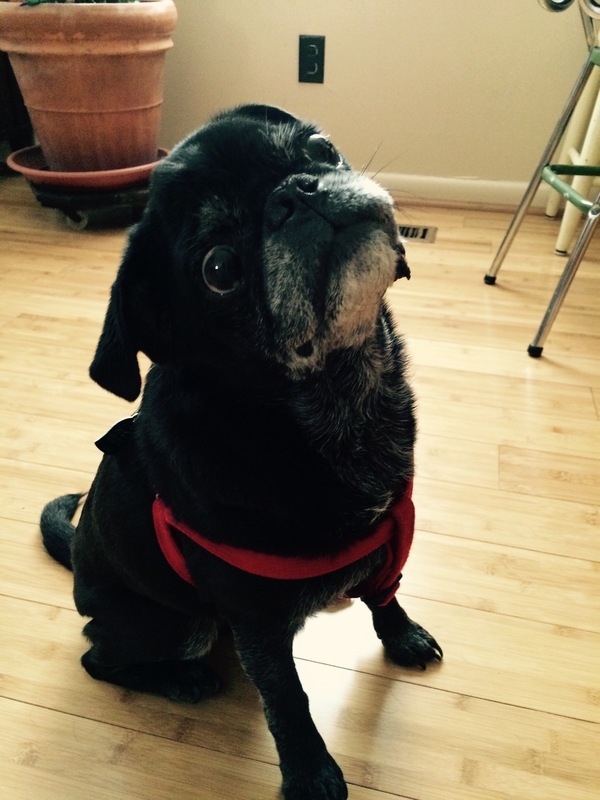 Wishing you all a happy tail with a happy ending and an Elvis sighting that brings you joy. His sweet Mama was mortified. She immediately started correcting him and apologizing to me at the same time. She’s good like that. Bless her, I thought it was funny. I waved it off, laughing. They walked home “discussing” his fee. After we got home, I went over to thank them properly. I didn’t have a million dollars, but I did want him to know he was appreciated so I had a little something from Texas in hand. His Mama started laughing and told me what happened after they got home. She had explained to him that you don’t charge neighbors for helping out like that. That it was kind and part of being a good neighbor to help each other. Well there you go. Exactly right. Can’t argue with that logic. Y’all. That is just too precious right there, isn’t it? They–all these little people–are listening. So I fully expect Cooter to come up with something I need to pay him for tomorrow. Since his Daddy told him to get a job and all. No telling what it is for, but I expect I’ll hear about that tomorrow too. Tonight I’m thankful for children who lighten the load with the way they see the world and the laughter they bring. 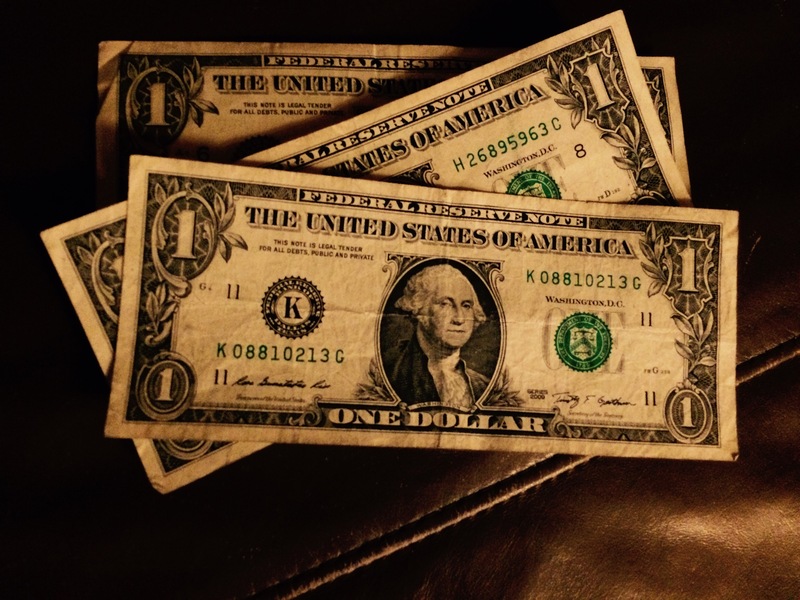 I give thanks for good neighbors and children willing to work for their dollars. Most of all, I’m thankful my sweet neighborfriends have moved back after two years of being away. We have missed them very much. Now they are back to being the Pineapple people, and I’m on a very special “birfday” list again. Life is good. 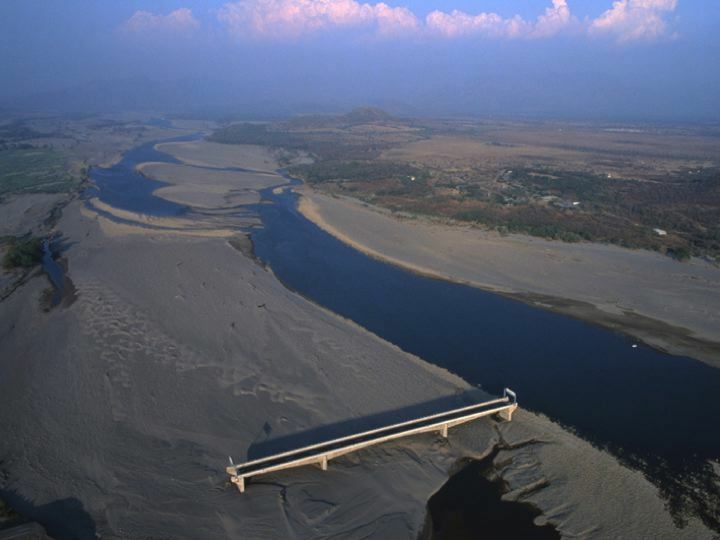 My friend sent out this photo of the Choluteca Bridge in Honduras for us to think about in preparation for tonight’s discussion at Evening Prayer, where we are having really great World Cafe style conversations. When I first saw it, this is the story it told me. We flew out to Texas on a plane. ON A PLANE. This was a huge big ol’ deal, since it had been ten years for some of us, never for one of us, and one has severe nut allergies. We did it. By grace and about a thousand wipes, we got there with no incident or problem, and we were thankful for it. He heard me. Which is huge for me. He nodded. “Yes, of course, we don’t want you to have any problems.” He started working on getting us one that would fit the need. It was a nice vehicle. Rode smoothly. Had a radio and AC. And IT RAN, so all was good in my book. We enjoyed having it during our trip for all the to and fros we had to make. We returned it on Monday and flew back home. When we arrived at the Atlanta airport, we waited on the sidewalk for the Fella to go to the long-term parking area and get our vehicle. As he pulled up to the curb and opened the side door, Cooter breathed in and let out a huge sigh of relief. Oh buddy. I get it. When we got home, things were still in their spots. No fairies or house elves or displaced princesses had shown up to tidy things up while we were gone. It was cluttered, a bit messy, and exactly as we had left it in our scurry and hurry to get to the airport on time. There’s a huge comfort in that for me. For all of us, I think. To be home. 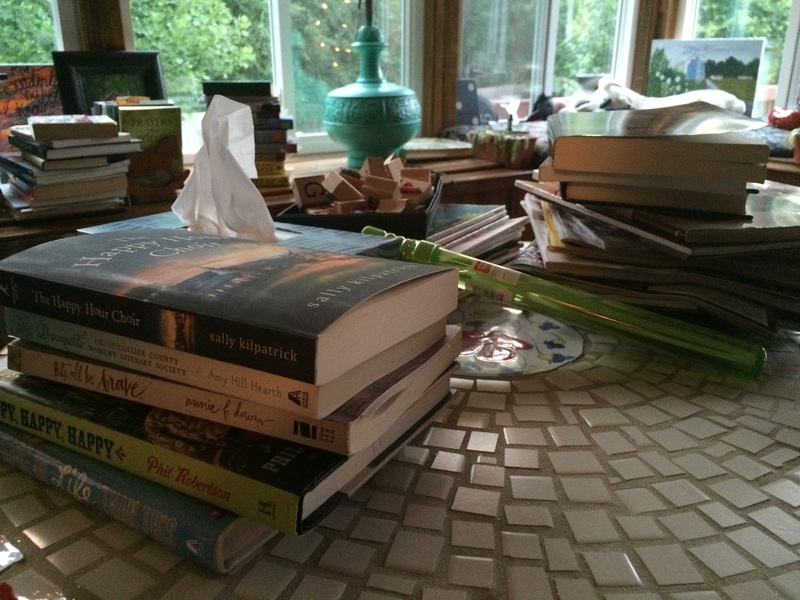 My writerfriend Cynthia at Flotsam of the Mind shared a photo essay over on her photography website called “Who We Are.” She is a talented photographer, and the thing that I love is that she makes the clutter in her house look like art. After returning home from our trip, I realize that our clutter and mess is some form of art. It expresses who we are, what we love, how we live…..it is a canvas of our family. I’m not saying I wish things weren’t a little neater around here. Show up at my door and more than likely I will be apologizing for the mess or pulling a door to so you don’t have to get the full on “opening night” art show. But returning home to it, seeing it with “new” eyes, I realize that the things that our mess says I’m pretty okay with. My point is, what surrounds us I am thankful for. Ten years from now when Cooter leaves the house (or doesn’t as he threatens says quite often) for college, I will miss this clutter. 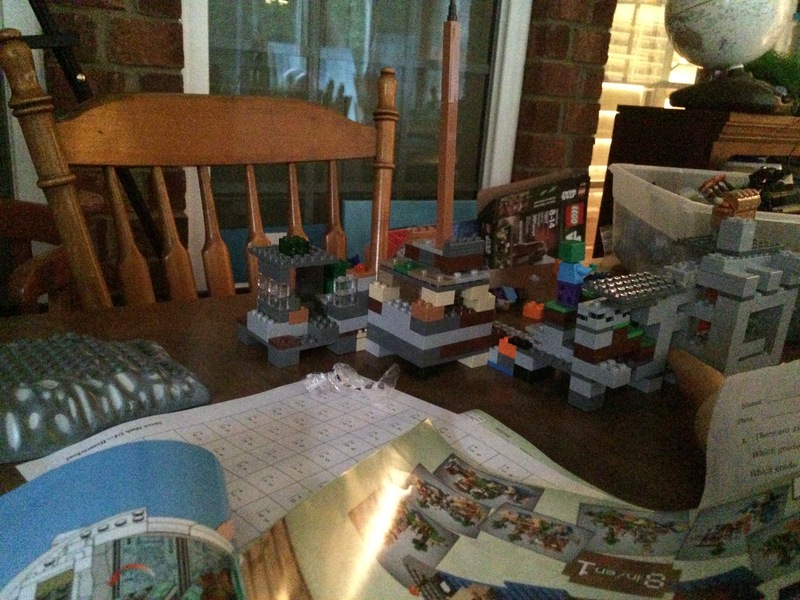 I will miss the scattered cars, Legos, books, pencils, stickers, sequins, clothes, socks, purses and shoes for days….. So yeah, Cooter had it right. It might be a mess, but it’s our mess. And I am thankful for it but even more thankful for those I love who are here to create it. I’m not as talented a photographer as Cynthia, and I’m not completely comfortable with our art show just yet, but here are a couple of shots I took after I read “Who We Are.” These are both from our Back Porch Roost where work, play, and school all happen. Sometimes all at the same time. I’ve been cranky this evening. With my poor family. And I only threw Miss Sophie’s “baby” for her to retrieve about ten times. Just sad. This happens when night comes and I still don’t know what I’m writing about. And tonight that’s exactly where I’m at. It’s not writer’s block, although thank you Facebook ad for the link to find 101 topics to blog about. Actually, I have to admit that was a little scary. It’s like you’re listening to my conversations around here or something. No. What I have is a loss of words. So much pain. Brokenness. Fear. Anger. Divisiveness. Distrust. Hurt. I sit here contemplating my plans to write about the heat here in Georgia or about what Cooter said the other day that had us all cracking up and saying, Yes. That. It just all feels wrong tonight. Each and every day something happens that proves we are not as far from where we once were in this country and world as we would like to be. Not very far at all. Many years ago I was the director of a not-for-profit childcare center for low-income, working (or in school) families. Only three of the thirteen staff members were white. Most of the time our children were all African-American. One morning four-year old Whitney was in the office with me for a few minutes. She was a beautiful girl and very sweet. She looked up through the plate-glass window to the front door. Y’all. It was the first time that sweet child ever saw color. EVER. I could see it in her face and hear it in her voice. The very first time. Our children are not born with the vision to “see” color. One day they realize the differences, and what they do with that knowledge has a lot to do with us. And what we teach them from that moment on. I am uncomfortable. As a middle-class white woman, I do not feel like I can speak to the pain and brokenness in the racial divide. And yet, as a human being born and taught to love others–ALL others, I must speak out. My Mama and Daddy taught me right from wrong. We were not allowed to say many words–and “hate” was one of them. We were never, ever allowed to leave someone out. That could get us in more trouble than a little bit. We were taught that all life is precious. All life. No matter the shape, size, color, beliefs, dialect, country of origin, sense of humor, nothing–ALL MATTERED. And I expect if they were here, they’d be just as torn up over all the goings on in our world today as I am. Only they’d have wisdom to share to help me process it and figure out what I can do to change things. I have nothing right now. Except my words. And they gave those to me, so I guess this is a start. I know this has been happening for a long, long time. This division and pain and fear and pointing fingers and killing of innocent people perceived to be “less than.” I guess it’s just taken me this long to get fed up enough to say something. And for that, I am sorry. I should not have been silent in the face of injustice and hatred. EVER. Tonight I’m asking all of you to think of four-year old Whitney. Think of the little ones around me and you and all of us who are looking to us for love and guidance and examples of how to love. Knowing that, let’s go out and love others and give the children one heck of an example to follow. Let’s love the mess out of folks–all folks, those who live next door and those whom we see at the grocery store, and those we come across at the ball park or the restaurant or on our walks into the office building. Those who think or look like us and those who don’t. Seeing that we love all, that we treat all people as if they matter (BECAUSE. THEY. DO. ), the children will begin to do the same. It’s not a perfect system. It’s as broken as we all are really. But if we start showing the little ones how to love and loving their little spirits for the sheer joy of loving*, then one day we might have a violence free day. One day people of all different backgrounds and beliefs might be able to sit and break bread together with no fear of misunderstandings or acts of hatred. One day, we might just get this living in community thing right. But it has to start with each and every one of us. And it has to start now y’all. Tonight. Go surprise someone and tell them you love ’em. And mean it. Let’s fight hatred with love. Darkness with light. Pain with a healing touch. *My oldest was blessed to know Rev. William Hurdle, who served as Chaplain at Wesleyan College for over sixteen years until his death in January of this year. When I think about loving folks, the line that seemed to be his mantra never fails to come to mind. 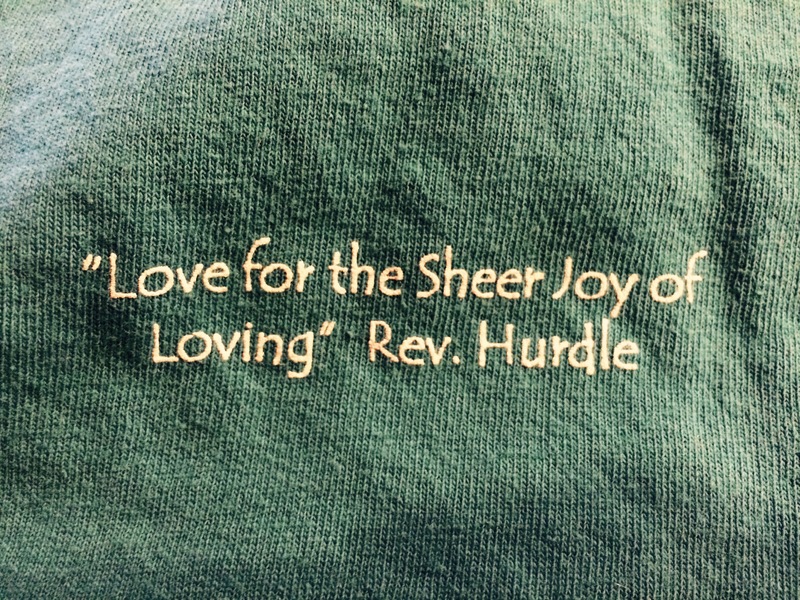 “Love for the sheer joy of loving.” That dear man knew how to love all and love well. I was watching. So were many others. Who’s watching you and your loving ways?